Special 5- Castle is the final and sixth level in Special 5. It is based off World 5-Castle. The player starts off by landing on a Goomba and getting a + Clock, they must then proceed up this area and then go across some metal platforms that have some spiked cylinders on them. After this, there is a platform that is propelled into the air by lava, and then a small castle segment that leads to some more metal blocks. The metal blocks lead to a platform with two Goombas on it, and some more metal platforms on the left which lead to some more platforms. 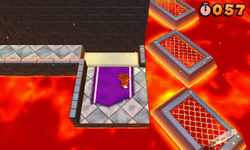 After these platforms, the Dry Bowser battle starts, the player needs to hit the switch at the end of the course to defeat Dry Bowser and then use the Warp Box to reach the Goal Pole. Star Medal 1: The first Star Medal is above the metal blocks that rise out of the lava. Star Medal 2: The second Star Medal is at the end of a metal block segment, where the metal blocks sink into the lava. Star Medal 3: The third Star Medal some Brick Blocks at the start of the Dry Bowser fight.